Sri Lanka has secured a US $ 50 million loan from the Asian Development Bank (ADB) for rooftop solar power generation project under the much hyped ‘Soorya bala sangramaya’ or battle for solar power programme. 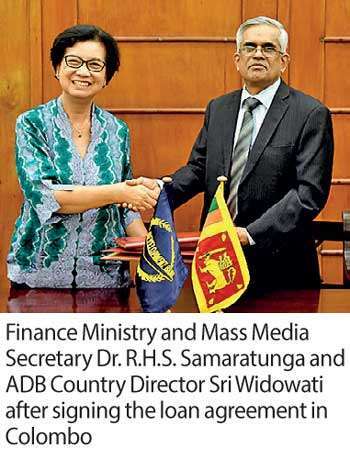 A Finance and Mass Media Ministry statement said the loan facility will help Sri Lanka to achieve its 200 MW target by 2020 and 1000 MW by 2025 through solar power generation. “Clean and sustainable power generation will be enhanced through the proposed project by increasing debt facilities and funding for the rooftop solar power generation, developing solar rooftop market infrastructure and bankable subproject pipeline,” the statement said. It is expected to add 50 MW to the national grid under this project. The project will operate under the ‘Enterprise Sri Lanka’ subsidized loan scheme, which has introduced a donor-funded refinance loan scheme to make provisions for rooftop solar power generation project with the aegis of the ADB. The households and the entrepreneurs will be provided maximum credit facilities up to Rs.7.5 million on a lending rate of 8 percent per annum. The Development Finance Department of Finance and Mass Media Ministry, which is the Implementing agency of the project, will coordinate with the selected banks and financial institutions to provide credit facilities to the customers to purchase rooftop solar panels from reliable suppliers who have registered under the Sustainable Energy Authority. The Ceylon Electricity Board (CEB) and Lanka Electricity Company Ltd (LECO) will support the project implementation by providing technical recommendations to the Financial Institutions regarding technical proposals of the applicants (customers) and reviewing and approving applications for connection of solar rooftop systems to the distribution network. In addition, customers will be benefited financially through one of the system among net metering, net accounting or net plus as a result of connecting solar electricity generated by this project to the national grid. The total investment cost of this project is US$ 59.8 million of which US$ 50 million will be provided by ADB. Equity contribution by customers for the subprojects will be US$ 9.8 million.